Ed. 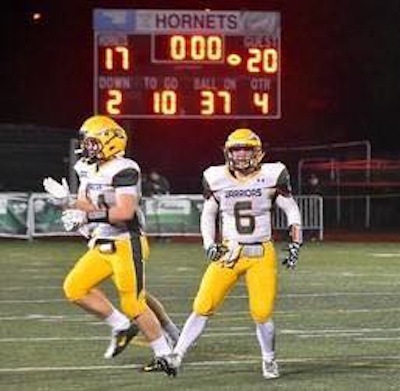 Note- Our Massachusetts football guru John Sarianides is back with five games to watch during Week 6 of MA high school football. Here are the biggest games of the week. If the Warriors want to get a step closer to locking up the Kelley-Rex division of the Hockomock League, they must win this game. It won’t be easy, as the Blue Bombardiers are starting to find their groove offensively, thanks to the dynamic quarterback duo of Tyler McGovern and Cam Furtado. Attleboro will challenge KP’s stout defense, but the Warriors have the speed and athleticism to challenge Attleboro’s high powered offense and slow them down. This game will come down to each team’s strength and which team makes the most plays. King Philip is battle tested, having won road games at North Attleboro and Mansfield, but the Blue Bombardiers present a different challenge. They have more big play ability than North and Mansfield, and that makes them dangerous. Expect an old school Hockomock type of game. Both teams need to win this game, so it will come down to the wire. For Scituate, it’s all about stopping Falmouth’s vaunted flexbone option offense, which averaging 38.8 points per game. The Clippers really put it on traditional Cape power Dennis-Yarmouth last week, beating them 53-13. Herb Devine’s Sailors must run the football, but they must also maximize possessions because they may not have the ball for more than six or seven possessions in this game. Falmouth’s defense has also been very good, so that is easier said than done. The Sailors lost a shootout to Hanover last week 42-34. The offense is there, but it may be tough to come by against a Falmouth team that is clicking on all cylinders right now. This is a big game for both programs as they try to make one final push to get into the Division 2 playoffs. For Shepherd Hill, the Rams' Double Wing offense has found its mojo again thanks to the addition of running back Kevin Mensah. Mensah has given Chris Lindstrom’s Rams that big play back who can take a rocket toss to the house on any touch. Shepherd Hill has outscored their last two opponents 90-26 with Mensah in the lineup. Dave Palazzi’s Blue Devils appear to be back on track after making a quarterback change. Palazzi replaced Noah Grey with sophomore Patrick Gallagher and moved Grey to wide receiver. The move paid off as the Blue Devils beat Algonquin 33-14 last week. Both teams have the potential to score points, so the game will come down to defense. Whichever defense rises to the occasion and gets stops in the second half will determine which team wins this game. Ground and pound vs the spread. This game will be a physical back-and-forth affair as both teams have potent offenses, and play physical defense. Wachusett can really pound the football and control the clock, something they will have to do against the vaunted Blur offense of St. John’s. Time of possession will be key in this game for the Mountaineers. As for St. John’s, they need to work their three step passing game and perimeter screens. Running inside on Wachusett is going to be tough sledding. The Pioneers have to identify the match ups that favor them and take advantage of them. I am glad I don’t pick games because this one will be tough to call. It could legitimately go either way. This game has the makings of being the best game in the state this weekend. The Eagles better be wary, because this has trap game written all over it. You better believe that Prep coach Brian St. Pierre will have his troops ready for this one. BC High needs to get off to another strong start offensively and make the Prep play from behind. St. John’s has big play ability, but it’ll be tough for them to overcome an early deficit if they fall too far behind. Expect BC High to give the Prep a heavy dose of tailback Danny Abraham early. BC High does a good job of mixing up their running game. They run the ball out of 21, 22 and 11 personnel. They put defenses in a bind. I think this will be a closer game than people think. BC High can’t overlook the Prep because they will lose, and then next week’s showdown with Xaverian will mean nothing.